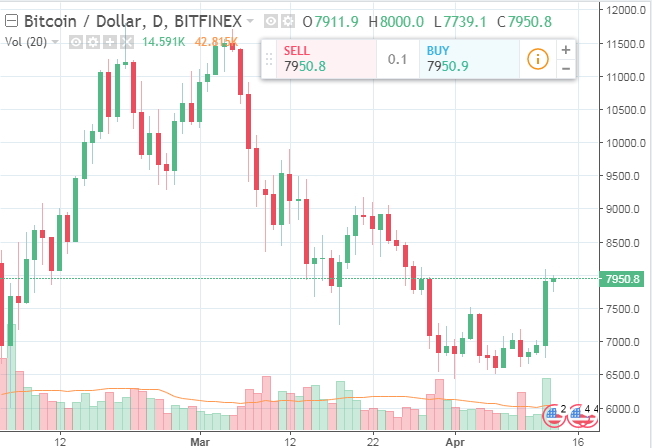 Now it seems that the long-term retracement of the USD/BTC exchange rate seen over the first quarter of the year is gradually reversing back for the uptrend. According to CoinMarketCap, earlier today, exchange rate broke above the 8000 USD/BTC threshold but then went back below it. It has been staying close to the threshold ever since. For now, it’s somewhere around 7900 USD/BTC. Anyway, over the last 24 hours the world’s first and most expensive cryptocurrency has appreciated by 13%. At the same time, 14 out of the TOP 15 cryptocurrencies in terms of market cap have also gained 7% to 27% over the same reporting period. It’s interesting to note that yesterday’s expert forecasts were pessimistic since the experts didn’t believe in a strong recovery in the near future. However, the digital currency did manage to disprove the pessimistic forecast later on by recovering by almost 14% (the trading volume exceeded 10 billion dollars). At the same time, optimists believe the downtrend is over and expect a new rally. BTC has been gaining over 10% a day for the second day in a row. According to NordFX, the BTC used to trade well over $8000 on Bitfinex earlier today.